Sewer pigs are trying to catch you. Jump over pools, dodge barrels and collect coins to run faster. This game is for true games as you must escape the pig on your back and collect some sort of useful stuff. Just dodge troubles and watch the distance covered. 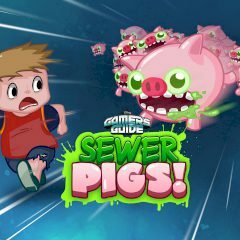 Games Similar Gamer's Guide Sewer Pigs!